15. km to Oludeniz, 30 km. to Saklikent canyon, 60 km. to Patara, 55 km. to the Dalaman Airport. 2 outdoor restaurants * indoor restaurant * terrace bar * lobby bar * pool (snack) bar * meeting room * TV lounge. 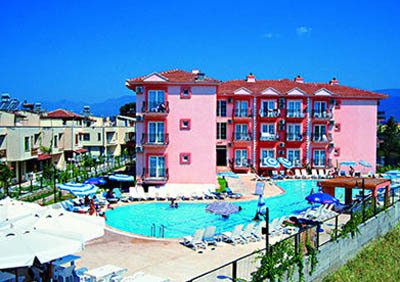 Outdoor swimming pool (with children’s section) * fitness centre * table tennis * dart * pin ball. Massage * laundry * internet corner * hairdresser * trekking * rafting * hillside parachuting * diving * canoe * safari * billiards. 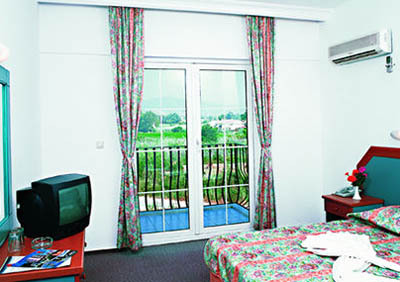 Balcony * air condition * TV * music system * direct dial telephone * shower * toilet * hairdryer * safe box. 100 meter away from the beach.